UPDATE 4/26/2017: The U.S. Attorney’s office alongside Baltimore City Police have made an arrest in the murder of McKenzie Elliott. Terrell Plummer, a member of the “Old York Money Gang” is charged with firing the shot that killed McKenzie while she played outside her home. The reward in this case, for information leading to an arrest and conviction is up to $8550.95. 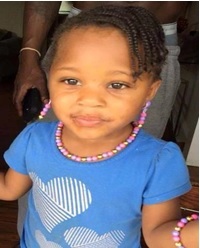 On Friday, August 1, 2014 at 3:51 PM., McKenzie Elliot, 3 years old (pictured above), was shot to death in the 3600 blk of Old York Rd. while standing on the porch of her house. Baltimore homicide detectives are urging anyone with information to please contact Metro Crime Stoppers or the Baltimore Police Department.